Because actual or perceived environmental contamination in urban infill sites - along with the risks and costs associated with addressing it - is a significant barrier to redevelopment in the Eastward Ho! corridor, the Partnership is targeting the remediation and sustainable reuse of contaminated and abandoned or underused sites as part of the larger Eastward Ho! effort. Pursuant to Chapter 380, Florida Statutes, Regional Planning Councils are charged with the coordination of multi-jurisdictional agency review of large-scale development projects, which may impact more than one County. These projects, known as Developments of Regional Impact (DRIs), are typically complex and require input from numerous reviewing agencies. The South Florida Regional Planning Council maintains a very active DRI program. The Council's Comprehensive Economic Development Strategy provides economic information and technical assistance to local governments, private businesses, and neighborhood-based organizations with respect to the creation and expansion of employment opportunities, thereby maintaining our designation as an Economic Development District. The South Florida Regional Planning Council is responsible for the review of applications for state and federal permits and requests for funding from state and federal agencies for projects within the South Florida region. Florida Power and Light (FPL) submitted a Site Certification Application to Florida Department of Environmental Protection (FDEP) on June 30, 2009. If approved, the application would allow FPL to expand nuclear energy production at its Turkey Point facility in Miami-Dade County. The proposed project consists of the construction of two new nuclear units, 6 and 7, and supporting facilities, as well as the placement of new transmission lines. The new units are expected to add approximately, 2,200 megawatts (mW) of electrical generation. The Council regularly reviews local government comprehensive plans and plan amendments for consistency with the Strategic Regional Policy Plan (SRPP). Local governments amend their plans regularly to adjust to changing conditions. Plan and plan amendments are reviewed to determine compatibility with the SRPP and for extra-jurisdictional impacts. The LEPC was established as required by the Emergency Planning and Community Right-To-Know Act (EPCRA), Title III of the Superfund Amendments and Reauthorization Act (SARA). Congress enacted EPCRA in an effort to help local communities protect public health and safety and the environment from chemical hazards. The SFRPC has identified affordable housing as a priority concern. The Council directed staff to initiate efforts to address the affordable housing situation in the Region. The Council works with the region�s Metropolitan Planning Organizations, Florida Department of Transportation, other state and federal agencies, counties, cities and the private and nonprofit sectors to make sure that transportation initiatives and improvements are supportive of the goals and policies articulated in the Strategic Regional Policy Plan. Understanding the role that transportation plays in issues such as economic development, urban redevelopment and infill, community revitalization, brownfields remediation and reuse, environmental justice, emergency management, regional land use and water supply planning, regional transit and mobility, the creation of sustainable, livable communities, and conservation and recreational open space planning, the Council works to ensure that, to the greatest extent possible, transportation projects and initiatives support regional sustainability and an improved quality of life for the region�s existing and future residents. Intergovernmental coordination and collaboration with the private and public sectors is the key to creating a successful regional transportation system. Examples of ongoing partnerships and projects include the work of the State Road 7 Collaborative and the effort to create the South Florida Regional Transportation Authority. The South Florida Regional Planning Council Revolving Loan Fund is accepting applications from small to medium-sized businesses in Miami-Dade, Broward and Monroe Counties. The Southeast Florida 2060 initiative will work with the region�s stakeholders to build a regional vision which captures the dreams and hopes of its citizens for a brighter future and improved quality of life for themselves and their children. The Southeast Florida Clean Cities Coalition is part of the U.S. Department of Energy's National Clean Cities initiative. Clean Cities supports local decisions to reduce petroleum consumption in the transportation sector through the use of alternative fuels, advanced technology vehicles, and fuel economy measures. The Southeast Florida Clean Cities Coalition focuses on Broward, Miami-Dade, Monroe, and Palm Beach Counties to provide fuel-neutral policy direction in maximizing the use of vehicles operating on alternative fuels. The Southeast Florida Regional Partnership is a growing partnership of public, private, non-profit, and civic stakeholders from the seven-county region of Monroe, Miami-Dade, Broward, Palm Beach, Martin, St. Lucie, and Indian River Counties. The State Road 7/ US 441 collaborative is a unique organization dedicated to coordinating its resources to promote economic vitality through aesthetic improvements, redevelopment and safety. The Council, with input from other governmental entities and the private sector, prepares, adopts, and implements the goals and policies of the SRPP to balance the needs of the Region. The South Florida Regional Planning Council is engaged in an on-going collaboration with The Coordinating Council of Broward (CCB) to support integrated planning for health, education and human service delivery in Broward County. The Eastward Ho! Initiative seeks to revitalize and improve the quality of life in Southeast Florida�s historic, urban areas in an effort to lessen development pressure and urban sprawl in sensitive lands in the west that are needed to restore the Everglades ecosystem and protect the region�s future water supply. EV Ready Broward (EVRB) is a community based private/public partnership committed to the introduction of electric transportation in Broward County. The Institute for Community Collaboration has launched the Legacy Green Empowerment Program with funding from JOBS for LOW Income Individuals, under the U.S. Health and Human Services, Administration for Families and Children, Office of Community Services. This Program has enrolled 32 low-income and unemployed individuals from Coconut Grove, Liberty City, Miami, and Opa Locka to learn horticulture under a Master Gardner and culinary arts under a Master Chef. 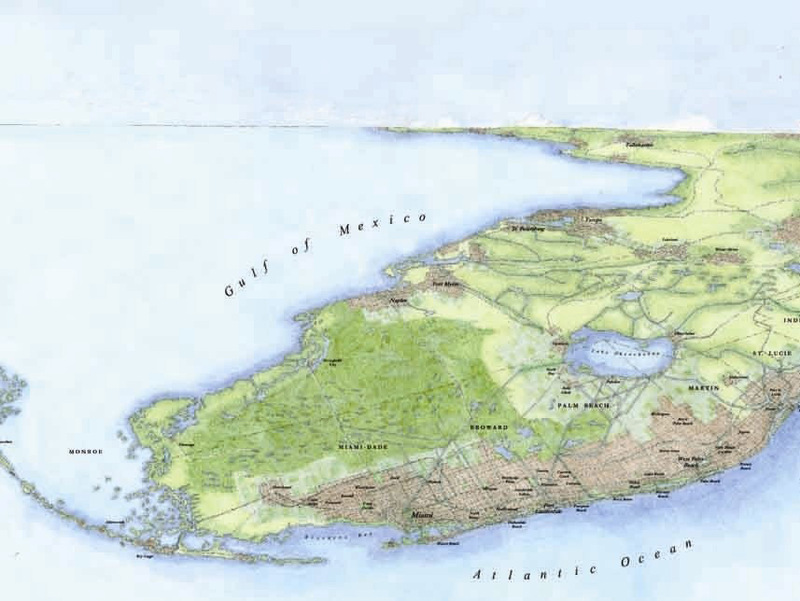 The SFRPC is managing the process for development of the Lake Belt Phase II Detailed Master Plan to ensure that future land uses, infrastructure, and recreational opportunities are consistent with the purposes established in Chapter 373.4149, Florida Statutes, Dade County Lake Belt Plan. This page and all contents prepared by the South Florida Regional Planning Council.